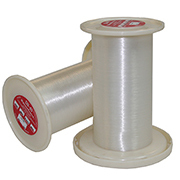 Shakespeare® pioneered WonderThread® monofilament nylon sewing thread for use in the apparel and home furnishing industries as well as outdoor sewing applications. This innovative product uses special resin blends for unmatched strength and softness, and the translucent nature reduces the need for color matching. These qualities have established Shakespeare® branded sewing thread as the premier monofilament sewing thread in the world. EnMart sells Shakespeare® brand nylon monofilament sewing thread in both soft and high tenacity versions.